Where head is a pointer to first node. Note: To keep this post short, readable and quick to consume. I have not explained logic to create and traverse list. How to delete first element by key? Step by step descriptive logic to delete first element by key from a singly linked list. Declare two variables that are pointer to our node. Say struct node *prev, *cur. Check if data of head node contains key to delete. If it does then, copy reference of head node to some temp node say prev. Adjust link for head node, to its next node and delete it. If head does not contain element to delete, then assign cur = head; and prev = NULL;. Check if data of current node is equal to key to delete. If it does, you got node to delete. Wait before deleting we need to adjust previous node links. If prev node is not NULL then make sure prev node points to element next to cur node i.e. prev->next = cur->next;. Finally delete cur node using free(cur) and terminate from function. Assign current node to previous node i.e. prev = cur. Move current node to next i.e. cur = cur->next;. Repeat step 5-6 till last node in the list. * C program to delete first node from Singly Linked List by key. * Delete first node by key from the list. How to delete last element by key? Deleting last node by key is little tricky then deleting first. We will use same logic, in addition we need to keep track of last node that contains key and node previous to it. Step by step descriptive logic to delete last node by key from a list. Declare four variables that are pointer to our node. Say struct node *prevToLast, *lastNodeToDel, *prev, *cur;. Initialize all of them with NULL. Check if data of head node contains key to delete. If it does then, copy reference of head node to lastNodeToDel. Check if (cur->data == key). If it does, you got node to delete, but we won't delete it immediately since it may not be the last node containing key. Hence, assign cur to lastNodeToDel. Assign prev to prevToLast, if prev != NULL. Copy cur to prev node. Move current node to next node i.e. cur = cur->next;. Repeat step 4-5 till last node. If lastNodeToDel != NULL, then we have a node to delete. But, before deleting we need to adjust its previous node link. Link prevToLast->next = lastNodeToDel->next. If lastNodeToDel is head node. Then, adjust link of head node to point to its next node i.e. head = head->next;. Finally delete lastNodeToDel and you are done. * C program to delete last node from Singly Linked List by key. * Delete last node having data as given key. How to delete all nodes by key? 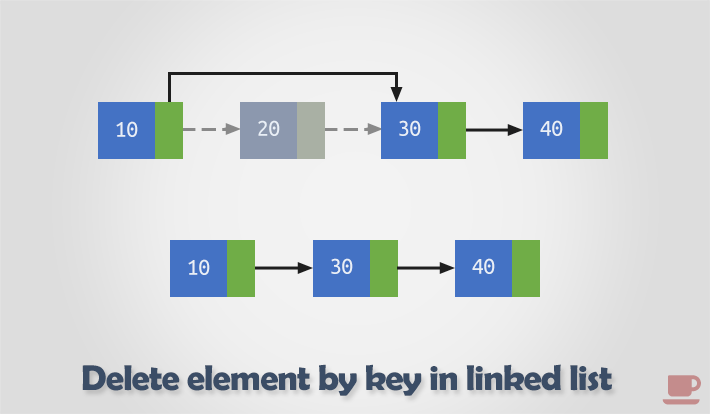 Logic to delete all nodes by key from a linked list is similar to deletion of first node. However, in first program to delete first element by key we terminated from function after deleting first node. But, here we will not terminate after deleting first element containing key. * C program to delete all nodes by given key in Singly Linked List. * Delete all nodes having data as given key. 3 elements deleted with key 1. C program to delete first node of a singly linked list. C program to delete last node of a singly linked list. C program to delete nth node of a singly linked list.